A trip to the league championship series was on the line. Matt Witkowski just needed to score. Tied at one in the tenth, Witkowski was put in to pinch run. A bad hop on the poor Boise field and Witkowski came around to score. "That's the breaks," Spokane second baseman Scott Bigham told The Spokesman-Review. "Anything can happen on this field." What happened to Witkowski was he got to play in eight seasons as a pro. He made AAA in two seasons. He never made the majors. Witkowski's career began that year in 1988, taken by the Padres in the ninth round of the draft out of Deer Valley High School in Arizona. He played much of his first season in the rookie Arizona League, getting up to Spokane at the end. He moved to single-A Charleston for 1989. He hit .283 there, with 26 stolen bases. He tried to stretch a single into a double, but got thrown out on a bad bounce. 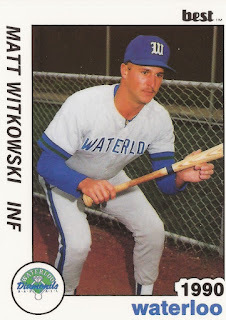 Witkowski played at single-A Waterloo for 1990. He hit .253 in 128 games. He had 55 RBI, two of them on a June single against Cedar Rapids. He made high-A High Desert in 1991, then AA Wichita in 1992. At Wichita, Witkowski hit .271. He also got five games at AAA Las Vegas. Witkowski played all of 1993 back at Las Vegas. He hit .283, but he didn't get a look at San Diego. He also returned to Wichita for 1994. At Wichita, Witkowski achieved the rare feat of playing all nine positions in one game. Witkowski played only one more season as a pro. He got 17 games with the Giants in 1995 at AA Shreveport, ending his career.